Kim Alison Little (born 29 June 1990) is a Scottish footballer who is a leading scorer on the Scotland women's national football team. She currently plays for Arsenal in the FA WSL. She previously played for NWSL club Seattle Reign FC and Melbourne City in the Australian W-League. During her first spell at Arsenal from 2008–2013, the team won four league titles, three WSL Continental Cups, three FA Cups and one Premier League Cup. Prior to her six years with Arsenal, Little played for Hibernian L.F.C. in the Scottish Women's Premier League (SWPL). During her 18 months with the club, they won the SWPL championship title, Scottish Cup, and the Premier League Cup. Little has represented Scotland at the senior international level since age 16. She was one of two Scots selected for the Great Britain squad that reached the quarterfinals of the 2012 London Olympics. In 2010, she was named the FA's Women's Player of the Year. In 2013, she became the first recipient of the PFA Women's Players' Player of the Year award. In 2016, she was named BBC Women's Footballer of the Year after being nominated for the second consecutive year. Born in Aberdeen, Scotland and raised in Mintlaw, Aberdeenshire, Little began playing football at a young age with her father and brother. She played football for her primary school and local boys teams as a youth. From age 10 to 14, she played at the youth level for Buchan Girls before joining the Hibernian Girls in 2005. At age 13, she attended and played for Mintlaw Academy. During her time with Hibernian Girls, Little would travel about two and half hours each way from Aberdeen to Edinburgh for training. Of her youth, Little said, "Football gave me opportunities from a young age. Having the chance to travel, to play in different environments and to come up against really good players from all over Europe was fantastic and made me more determined to keep playing." Little attended the University of Hertfordshire when she obtained a degree in Sports Studies while playing for Arsenal L.F.C..
At the age of 16, Little made her debut for Hibernian L.F.C. of the Scottish Women's Premier League (SWPL) during a UEFA Women's Champions League match against RCD Espanyol at Almondvale Stadium on 8 August 2006. Hibs had signed Little and other players from their youth team to replace veterans Pauline Hamill, Nicky Grant and Debbie McWhinnie who all left the club that summer. In her SWPL league debut, she scored a hat trick against Hutchison Vale L.F.C. During her time with Hibernian, Little helped the club win the SWPL championship title, Scottish Cup, and the Premier League Cup. She competed with the team in the UEFA Women's Champions League twice. During the 2006–07 season, Hibernian won every match with Little scoring 55 goals in her 30 appearances for the club. The following season, she scored 33 goals in 18 appearances with the club. In March 2008 at the age of 17, Little joined Arsenal in the FA Women's Premier League National Division. She scored her first goal for the club in April, during a 4–1 win over Chelsea before 5,000 fans at Emirates Stadium. Arsenal manager Vic Akers told reporters: "Make a note of this kid, she's going to be a big player." She was not eligible to play in Arsenal's 4–1 FA Women's Cup Final victory over Leeds United on 5 May 2008. Little played in every league match during the 2008–09 season bar one, scoring 24 goals. Arsenal finished at the top of the regular season table with a 20–1–1 record. She also played in the 5–0 Premier League Cup Final victory over Doncaster Rovers Belles and scored in the FA Women's Cup Final as Arsenal beat Sunderland 2–1 before almost 25,000 fans at Pride Park in Derby. Little later described 2008–09 as her most memorable season, as Arsenal won a treble despite the departure of several leading players to Women's Professional Soccer (WPS) in America. The following season Little's prolific goal scoring from the midfield helped Arsenal overcome the departure of Kelly Smith. After 47 goals in all competitions, the team finished the regular season in first place with a 20–1–1 record. Little was the league's leading scorer with 17 goals. She was named FA Players' Player of the Year in June 2010. Arsenal entered the 2010 FA Women's Cup Final hoping to lift the trophy for a fifth consecutive year. Despite Little's first half penalty, they were eventually upset 3–2 by Everton, after extra time. In 2011, the FA WSL was formed replacing the FA Women's Premier League as the top division of women's football in England. During the 2011 season, Little was the second-leading scorer in the league with nine goals. 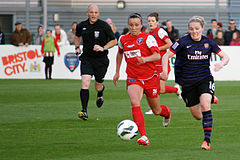 She scored a brace during a match against Doncaster Belles on 7 May 2011. Arsenal finished at the top of the league table with a 10–2–2 record. At the 2011 FA Women's Cup Final, Little was named Player of the Match and scored the opening goal in Arsenal's 2–0 win over Bristol Academy. After the game Arsenal manager Laura Harvey described Little as "world class." During the 2012 season, Little was the league's top scorer with 11 goals. Arsenal clinched the regular season title with an undefeated 10–4–0 record and claimed their ninth consecutive English title. During a match against Chelsea L.F.C. on 26 April, she scored a brace with goals in the 47th and 90th minutes helping Arsenal win 3–1. She scored another brace during a 2–0 win against Liverpool L.F.C. on 6 May. Little was voted Women's Players' Player of the Year for 2012–13 by the Professional Footballers' Association, in the first year that the award was given to women. Upon receiving the award, Little said, "For years, I have watched this event on television, so to come here and win the first award is fantastic." Prior to the 2013 season, Arsenal's head coach Laura Harvey left for Seattle Reign FC in the United States. Under new head coach Shelley Kerr, the Arsenal finished third in the regular season standings with a 10–3–1 record. In her 14 appearances for the club, Little scored three goals. In November 2013, Little left deposed champions Arsenal after six years for American National Women's Soccer League (NWSL) club Seattle Reign FC. Laura Harvey had departed Arsenal to coach Seattle Reign the previous year and had made Little her top transfer target. Of the signing, Harvey said, "Kim is world-class. Her talent and proven experience will be a huge asset for our team in the coming seasons. Having coached Kim for nearly four years, I have no doubt that her creativity and goal-scoring ability will prove an exciting proposition for the NWSL." During her first appearance for the Reign, she scored a brace against the Boston Breakers helping Seattle win 3–0. After scoring a league-high four goals during the month of April helping the Reign go undefeated in four games, she was named NWSL Player of the Month. She became the first player in the history of the league to be named Player of the Month twice after earning the honour for the month of May. Her five consecutive games with goals scored during the month tied the league record previously set by Abby Wambach during the previous season. She was named Player of the Month for a third time for the month of July after her three goals and four assists in six games helped Seattle secure a 4–1–1 record and clinch the 2014 NWSL Shield (regular season title) several weeks before the end of the season. The Reign finished the regular season with a 16–2–6 record and 54 points – 13 points ahead of the second place team, FC Kansas City. During the team's playoff semi-final match against Washington Spirit, Little scored one goal helping the Reign win 2–1 and advance to the championship final against FC Kansas City. The team was defeated by Kansas City 2–1. Little was named league MVP in her first season with the club. Her 16 goals during the regular season also earned her the league's Golden Boot award. Her seven assists tied for second highest in the league. After returning to the Reign for the 2015 season, Little was the team's leading scorer with 10 goals (second in the league following Crystal Dunn with 15). Her seven assists ranked first in the league. The Reign finished the regular season in first place clinching the NWSL Shield for the second consecutive time. After advancing to the playoffs, Seattle faced fourth-place team Washington Spirit and won 3–0, advancing to the championship final. Seattle was ultimately defeated 1–0 by FC Kansas City during the championship final in Portland. Little, along with teammates Lauren Barnes, Beverly Yanez, and Jess Fishlock, were named to the NWSL Best XI team. During the first few months of the 2016 season, a number of offensive players became unavailable due to injury including Manon Melis, Jess Fishlock and Megan Rapinoe. During the team's second game of the season, Little served two assists and scored a goal in the 79th minute to secure a 3–0 win against the Boston Breakers. The following week, she scored the lone goal of the match against FC Kansas City. Little finished the regular season with six goals and two assists. Seattle finished the regular season in fifth place with a 8–6–8 record, narrowly missing a playoff spot by two points. On 17 October 2016, Little announced that she would return to Arsenal L.F.C ahead of the 2017–18 FA WSL season. Harvey said Little was given an "incredible offer" of a multi-year contract, though no other details were disclosed. In October 2015, it was announced that Little had signed with Australian W-League team Melbourne City along with Seattle Reign FC teammate Jess Fishlock on loan for the 2015–16 season. On 9 November, she was named the league's Player of the Match after her first start for the club following international duty for Scotland. On 6 December, she served an assist to the first goal of the match by Scottish national teammate Jennifer Beattie and then scored a goal in the 80th minute against Melbourne Victory solidifying City's 4–0 win over their rival and extending City's regular season record to 8–0–0. Little ended the season having played 12 games for Melbourne City and scoring 9 goals, ranking only behind Larissa Crummer. Melbourne City won both the regular season and Grand Final. Little earned Player of the Match Award honours in the Grand Final. On 4 February, Little announced that she would not return to Melbourne City for the 2016–2017 season, saying her time in the W-League was "a one year thing for me" and citing other priorities in October 2016, which she later announced as her transfer from Seattle Reign FC to Arsenal L.F.C.. In May 2017, Little sustained a rupture to her cruciate ligament during training with Arsenal, missing the better part of the season. On 14 March 2018, in the FA WSL Continental Tyres Cup final, Arsenal defeated Manchester City 1–0 to claim their fifth title. Little suffered a fracture to a fibula during a 5–0 win against Chelsea in October 2018. The match officials were criticised for failing to send off Chelsea's Drew Spence, whose "heavy tackle" had injured Little. It was estimated that the injury would prevent her from playing for 10 weeks. 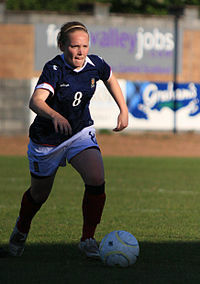 Little made her debut for the Scotland women's national football team in February 2007 at the age of 16 in a match against Japan, coming in as a second-half substitute for Megan Sneddon. National coach Anna Signeul had no hesitation in promoting Little into the senior team at 16: "Kim is an exceptional talent. There's no limit to how far she can progress. She has technique, speed and power, and she reads the game extremely well." She scored her first international goal as Scotland lost to Russia in March 2008. During her 50th cap, Little scored the game-opening goal in Scotland's 2–0 victory against rival England at the Cyprus Cup in March 2011. It was only the second time Scotland had ever defeated their rivals, and was the first time since 1977 – 13 years before Little was born. On 16 June 2012, Little scored Scotland's first hat trick during the team's 8–0 win against Israel. In October 2012, she scored in both legs of Scotland's UEFA Women's Euro 2013 qualifying play-off against Spain. In the second leg Verónica Boquete scored in injury time of extra time to make the score 3–2 to Spain and eliminate the Scots, who were left "utterly disconsolate" at missing out on qualification for their first ever final tournament. In February 2013, Little scored Scotland's only goal during a friendly match against the United States in which the U.S. won 4–1. During the 2013 Cyprus Cup, Little scored a goal and served an assist in Scotland's 4–4 draw against England during the group stage of the tournament. She scored another goal in the 11th minute of the team's fifth place match against the Netherlands resulting in a 1–0 win for Scotland. Little missed UEFA Women's Euro 2017 due to her serious injury. After recovering from the injury, she helped Scotland qualify for the 2019 FIFA Women's World Cup, their first appearance in a world finals. Little scored the only goal in a friendly against Brazil in April 2019. Despite opposition from Scottish Football Association with regard to Scottish players playing on a British team, Little was strongly in favour of participating in the Great Britain team at the 2012 London Olympics: "I don't see why anyone would want to stop a player from playing at a massive tournament like the Olympics, it's the biggest sporting event ever. If I get the opportunity I'll grab it with both hands – I would definitely play." Little was called up to the 18-player squad, one of only two non-English players chosen by team manager Hope Powell, the other being fellow Scot Ifeoma Dieke. Little chose not to sing the national anthem of the United Kingdom before the team's first competitive game, a 1–0 win against New Zealand. The Daily Telegraph newspaper reported that the British Olympic Association were angered by this. Hope Powell said she was not concerned, as some players prefer not to interrupt their pre-match preparation by singing the anthem. Two male Welsh footballers also made personal decisions to not sing the anthem. Little provided two assists in the team's second group stage match, a 3–0 win against Cameroon. After winning all three matches and finishing at the top of the table for Group E in the group stage of the tournament, Great Britain advanced to the quarter finals where they faced Canada in front of 28,828 spectators at City of Coventry Stadium. Little started the match and played for 82 minutes, but Great Britain lost 2–0 and were knocked out of the tournament. Little typically plays as the advanced midfielder in Laura Harvey's 4–3–3 formation, but occupies a deeper role when playing for Scotland. In an interview with FIFA.com in July 2012, Little said: "Nearly all my goals come from midfield. That’s my natural position. But I’m a player who always tries to make forward runs, be positive and to create and score goals." Little confirmed in an interview in 2014 that she had been in a long-term relationship with professional footballer Tom Pett. In 2016, she appeared in a national campaign for Athlete Ally. 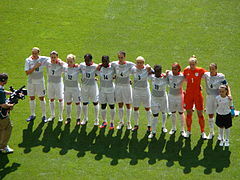 ^ a b "Women's Olympic Football Tournament London 2012 – List of Players Great Britain" (PDF). FIFA. 24 July 2012. Retrieved 31 July 2012. ^ "Kim Little – Scotland National Team". Archived from the original on 3 January 2018. Retrieved 2 January 2018. ^ "Kim Little rejoins Arsenal Ladies". Arsenal F.C. 17 October 2016. Retrieved 19 October 2016. ^ "Lady Imps out to upset trailblazing Kim Little's Arsenal ambition". The Independent. 3 October 2013. Retrieved 20 November 2013. ^ a b c "Spotlight on Kim Little". Scottish Football Association. 8 March 2013. Retrieved 9 December 2013. ^ a b c "Kim Little". Scottish Football Association. Retrieved 8 December 2013. ^ a b c "Little on Big Progress". Hibernian FC. 19 March 2013. Retrieved 9 December 2013. ^ Leighton, Tony (11 October 2009). "Free-scoring Kim Little keeps Arsenal chasing treble". The Guardian. Retrieved 9 December 2013. ^ Corsie, Rachel. "Rachel Corsie: Kim Little a role model for all of Scottish football". The Away End. Archived from the original on 13 December 2013. Retrieved 9 December 2013. ^ White, Neil (6 August 2006). "Hibs women turn to youth for Europe test – Football". The Sunday Times. Retrieved 9 December 2013. ^ Hislop, John (22 November 2013). "Former Hibs star Kim Little signs for Seattle Reign". Edinburgh Reporter. Retrieved 8 December 2013. ^ a b c d "Kim Little: My debt to Hibs". Scottish Football Association. 19 March 2013. Retrieved 8 December 2013. ^ Kessel, Anna (4 May 2008). "The invincibles". The Guardian. Retrieved 3 June 2012. ^ Lansley, Peter (5 May 2008). "Arsenal's real Invincibles go for their FA Cup hat-trick – Women's FA Cup final". The Times. Retrieved 9 December 2013. ^ "16. Kim Little". Arsenal F.C. Retrieved 13 August 2009. ^ a b Taylor, Declan (26 February 2009). "Doncaster 0 – 5 Arsenal". Arsenal F.C. Retrieved 16 June 2014. ^ a b "Arsenal win FA Women's Cup". BBC. 4 May 2009. Retrieved 9 December 2013. ^ "Catching up with Scotland's rising star and Arsenal midfielder Kim Little". Our Game Magazine. 2 May 2011. Retrieved 9 December 2013. ^ Leighton, Tony (11 October 2009). "Free-scoring Kim Little keeps Arsenal chasing treble". The Guardian. London. Retrieved 5 September 2010. ^ "Statistics 2009–2010". Arsenal F.C. Archived from the original on 26 March 2012. Retrieved 13 August 2009. ^ a b "Key figures honoured at Women's awards". The Football Association. Archived from the original on 19 September 2012. Retrieved 5 September 2010. ^ Leighton, Tony (3 May 2010). "Everton upset Arsenal to win FA Women's Cup". BBC. Retrieved 9 December 2013. ^ "DONCASTER BELLES VS. ARSENAL 0 – 3". Soccer Way. Retrieved 9 December 2013. ^ "2011 WSL". Soccer Way. Retrieved 9 December 2013. ^ a b c Giuseppe Muro (23 May 2011). "Harvey pays tribute to 'world-class' Little". Arsenal F.C. Archived from the original on 25 May 2011. Retrieved 24 May 2011. ^ "2012 WSL". Soccer Way. Retrieved 9 December 2013. ^ "ARSENAL VS. CHELSEA 3 – 1". Soccer Way. Retrieved 9 December 2013. ^ "LIVERPOOL VS. ARSENAL 0 – 2". Soccer Way. Retrieved 9 December 2013. ^ a b "PFA Awards: Arsenal's Kim Little named Women's Player of Year". BBC Sport. 29 April 2013. Retrieved 29 April 2013. ^ Drysdale, Neil (29 April 2013). "Aberdeen-born footballer Kim Little wins PFA Player of the Year". STV News. Retrieved 9 December 2013. ^ "2013 WSL". Soccer Way. Retrieved 9 December 2013. ^ a b "Kim Little". Soccer Way. Retrieved 9 December 2013. ^ "Scotland & Arsenal midfielder Kim Little agrees Seattle switch". BBC Sport. 20 November 2013. Retrieved 20 November 2013. ^ "Reign Add Arsenal Star Midfielder Kim Little". Sounder at Heart. 20 November 2013. Retrieved 8 December 2013. ^ "Little strikes twice as Reign earn win, first shutout". The Equalizer. 13 April 2014. Retrieved 15 September 2014. ^ Mayers, Joshua (2 May 2014). "Reign FC midfielder Kim Little named NWSL Player of the Month for April". The Seattle Times. Retrieved 15 September 2014. ^ "Kim Little Voted Army National Guard Player of the Month". National Women's Soccer League. 4 June 2014. Retrieved 15 September 2014. ^ "Kim Little Voted Army National Guard Player of the Month". National Women's Soccer League. 4 August 2014. Retrieved 15 September 2014. ^ "Seattle Reign FC Capture NWSL Shield". National Women's Soccer League. 31 July 2014. Archived from the original on 17 August 2014. Retrieved 15 September 2014. ^ Oshan, Jeremiah (24 August 2014). "Seattle Reign will face FC Kansas City in NWSL finals". SB Nation. Retrieved 15 September 2014. ^ Evans, Jayda (31 August 2014). "NWSL title game: Reign FC falls, 2–1, to FC Kansas City". The Seattle Times. Retrieved 15 September 2014. ^ a b Oshan, Jeremiah (28 August 2014). "NWSL names Kim Little MVP". Sounder at Heart. Retrieved 15 September 2014. ^ "2014 NWSL Player Statistics". National Women's Soccer League. Archived from the original on 7 January 2015. Retrieved 15 September 2014. ^ "Kim Little, the low-profile world-beater". FIFA. 3 March 2016. Retrieved 28 November 2016. ^ "2015 NWSL season". Soccer Way. Retrieved 7 November 2015. ^ "SEATTLE REIGN WIN NWSL SHIELD FOR 2ND STRAIGHT SEASON". ESPN. 27 August 2015. Retrieved 10 October 2015. ^ "Seattle Reign shuts out Washington Spirit, 3–0, in NWSL semifinal". The Seattle Times. 13 September 2015. Retrieved 7 November 2015. ^ Goldberg, Jamie (1 October 2015). "NWSL Championship Game: FC Kansas City 1, Seattle Reign 0 – Live chat and updates recap". The Oregonian. Retrieved 10 October 2015. ^ "our Seattle Reign players make NWSL Best XI squad". Sounder at Heart. 24 September 2015. Retrieved 10 October 2015. ^ Rantz, Susie (20 May 2016). "Seattle Reign's Manon Melis suffers tibia fracture". Sounder at Heart. Retrieved 4 October 2016. ^ Rantz, Susie (28 April 2016). "Jess Fishlock out 4–6 weeks with tibia fracture". Sounder at Heart. Retrieved 4 October 2016. ^ "One Day at a Time". Megan Rapinoe. 10 June 2016. Retrieved 4 October 2016. ^ "2016 NWSL". Soccer Way. Retrieved 4 October 2016. ^ a b Matt Pentz (17 October 2016). "Kim Little transfers from Seattle Reign to Arsenal Ladies". The Seattle Times. Retrieved 1 November 2016. ^ "Seattle's Kim Little and Jess Fishlock join Melbourne". BBC. 12 October 2015. Retrieved 6 December 2015. ^ "W-League: Little named player-of-the-match". Melbourne City FC. 9 November 2015. Retrieved 6 December 2015. ^ "Melbourne City continue dominance of W-League with derby win over Victory". The Guardian. 6 December 2015. Retrieved 6 December 2015. ^ Cherny, Daniel (6 December 2015). "W-League Melbourne Derby: Melbourne City beat Melbourne Victory 4–0". The Age. Retrieved 6 December 2015. ^ Lynch, Michael (31 January 2016). "Melbourne City crown perfect season with W-League grand final win over Sydney FC". The Age. Retrieved 4 May 2016. ^ Lynch, Michael (31 January 2016). "Melbourne City star Kim Little wins player of grand final award". The Age. ^ Jordan Kounelis (4 February 2016). "Kim Little not returning to Melbourne City next season". MFootball. Archived from the original on 19 December 2016. Retrieved 1 November 2016. ^ "Kim Little ruptures cruciate ligament". Arsenal F.C. 25 May 2017. Retrieved 30 March 2018. ^ "Arsenal 1–0 Everton: How it happened". Arsenal F.C. 14 March 2018. Retrieved 20 March 2018. ^ a b "Continental Cup: Arsenal 1–0 Man City – Report". Arsenal F.C. 14 March 2018. Retrieved 30 March 2018. ^ a b "Kim Little: Lucy Bronze criticises officials as Arsenal's Scotland midfielder fractures leg". BBC Sport. 17 October 2018. Retrieved 17 October 2018. ^ "Japan v Scotland". The Scottish FA. Retrieved 13 August 2009. ^ "Kim, 16, is Miss match". Daily Record. 12 February 2007. Archived from the original on 24 September 2015. Retrieved 9 December 2013. ^ Leighton, Tony (4 March 2011). "England 0–2 Scotland". BBC Sport. Retrieved 4 March 2011. ^ a b "U.S. Women's National Team Plays "2nd Leg" Against Scotland". United States Soccer Federation. 12 February 2013. Archived from the original on 12 December 2013. Retrieved 9 December 2013. ^ Lamont, Alasdair (24 October 2013). "Scotland suffer late loss to Spain in Euro 2013 play-off". BBC. Retrieved 20 November 2013. ^ Leighton, Tony (8 March 2013). "Kim Little rallies Scotland for spectacular draw with England". The Guardian. Retrieved 9 December 2013. ^ Leighton, Tony (13 March 2013). "Cyprus Cup: Scotland beat Netherlands to finish fifth". BBC. Retrieved 9 December 2013. ^ "Kim Little: Scotland and Arsenal midfielder injured before Euro 2017". BBC. 25 May 2017. Retrieved 30 March 2018. ^ a b MacNeil, Marion; Dewar, Heather (9 April 2019). "Kim Little: Brazil strike 'once in lifetime goal' says Scotland midfielder". BBC Sport. Retrieved 9 April 2019. ^ Leighton, Tony (4 September 2011). "Scotland's Kim Little wants to play for Great Britain at 2012 Olympics". The Guardian. Retrieved 1 April 2012. ^ Drysdale, Neil (26 June 2012). "Kim Little realises her big ambition to compete at the Olympics". STV News. STV. Retrieved 9 December 2013. ^ "Scotland's Kim Little 'would play for Team GB'". BBC News. 22 September 2011. Retrieved 9 December 2013. ^ a b Silverman, Rosa (27 July 2012). "London 2012 Olympics: Team GB athletes in National Anthem singing row". The Daily Telegraph. Retrieved 11 December 2013. ^ Clutton, Graham (27 July 2012). "London 2012 Olympics: Team GB women's football team's Scottish players can opt out of singing national anthem". The Daily Telegraph. Retrieved 11 December 2013. ^ York, Chris (27 July 2012). "Ryan Giggs And Craig Bellamy Snub National Anthem At Olympic Opening Match". HuffPost. Retrieved 13 December 2013. ^ Fletcher, Paul (28 July 2012). "Great Britain beat Cameroon 3–0 to progress". BBC Sport. Retrieved 29 July 2012. ^ "Women's Olympic Football Tournament: Great Britain 0:2 (0:2) Canada". FIFA. Retrieved 9 December 2013. ^ Campbell, Alan (5 April 2012). "Little takes on big responsibility with forward role". The Herald. Retrieved 31 July 2012. ^ "Big dreams for GB's Little". FIFA. 23 July 2012. Retrieved 31 July 2012. ^ "Inside Reign, Episode 2 "Little" (The second episode in a series on Seattle Reign FC, featuring personal interviews with the extraordinary players and behind-the-scenes footage of training)". Retrieved 16 June 2014. ^ "Seattle Reign FC and FC Kansas City Team up for Athlete Ally's EveryFan Campaign". Athlete Ally. 1 May 2016. Archived from the original on 16 May 2016. Retrieved 4 May 2016. ^ Mayers, Joshua (4 June 2014). "Reign FC's Kim Little wins NWSL Player of the Month — again". The Seattle Times. Retrieved 5 June 2014. ^ "KIM LITTLE VOTED ARMY NATIONAL GUARD PLAYER OF THE MONTH". National Women's Soccer League. 4 August 2014. Archived from the original on 17 August 2014. Retrieved 4 August 2014. ^ Pentz, Matt (2 July 2015). "Reign midfielder Kim Little voted NWSL Player of the Month". The Seattle Times. Retrieved 3 July 2015. ^ "REIGN FC KIM LITTLE VOTED NWSL PLAYER OF THE WEEK". National Women's Soccer League. 25 August 2015. Archived from the original on 27 August 2015. Retrieved 28 September 2015. ^ "Reign FC Midfielder Kim Little Voted Player of the Week". National Women's Soccer League. 26 April 2016. Archived from the original on 30 April 2016. Retrieved 27 April 2016. ^ "Kim Little Wins 2014 NWSL Golden Boot". Yahoo! Sports. 21 August 2014. Retrieved 15 September 2014. ^ Blakely, Chris (4 May 2016). "Kim Little named NWSL Player of the Week for second straight week". Vavel. Retrieved 4 May 2016. ^ Lynch, Michael (31 January 2016). "Melbourne City star Kim Little wins player of grand final award". The Age. Retrieved 4 May 2016. ^ "BBC Women's Footballer of the Year nominations revealed". BBC. 26 April 2015. Retrieved 4 May 2016. ^ "BBC Women's Footballer of the Year: Five vie for award". BBC. 24 April 2016. Retrieved 3 May 2016. ^ "BBC Women's Footballer of the Year: Kim Little wins award". BBC. 24 May 2016. Retrieved 24 May 2016. ^ a b "Little leaves Ladies for Seattle Reign". Arsenal F.C. 20 November 2013. Archived from the original on 14 July 2014. Retrieved 16 June 2014. ^ "FA Women's Cup final: Arsenal Ladies beat Bristol Academy". BBC Sport. 26 May 2013. Retrieved 16 June 2014. ^ Yew, Oliver (25 September 2011). "Birmingham City 1 – Arsenal 4". Arsenal F.C. Retrieved 16 June 2014. ^ Dean, Sarah (11 October 2012). "Arsenal Ladies win Continental Cup in another boost for women's football". HuffPost. Retrieved 16 June 2014. ^ "Arsenal vs Lincoln 2–0, Continental Cup Final". Fawsl.com. Retrieved 16 June 2014. ^ "SEATTLE REIGN WIN NWSL SHIELD FOR 2ND STRAIGHT SEASON". ESPN. 27 August 2015. Retrieved 12 October 2015. ^ Lynch, Michael (28 December 2015). "-League: Melbourne City crowned premiers". The Age. Retrieved 4 May 2016. ^ "Kim Little of Melbourne City celebrates a goal with team mates during W-League grand final". ABC. 30 January 2016. Retrieved 4 May 2016. Wikimedia Commons has media related to Kim Little.